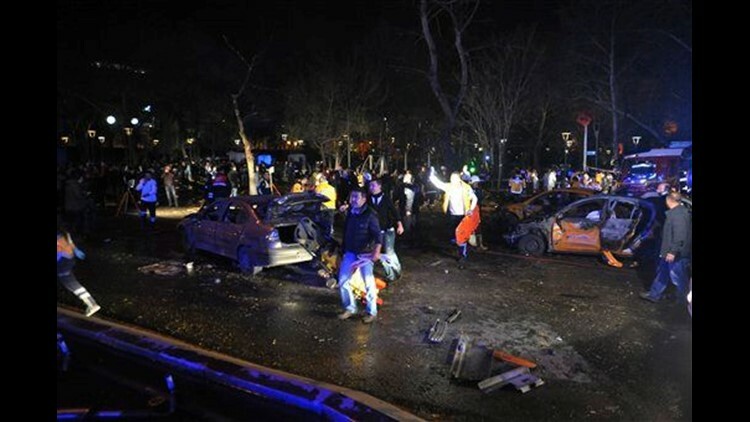 A car bombing in Turkey's capital has killed at least 27 people and wounded around 75 others on Sunday, officials said. ANKARA, Turkey (AP) — A suicide car bomb went off near bus stops in the heart of Turkey's capital on Sunday, killing at least 34 people and wounding around 125 others, officials said. Two of the dead are believed to be the assailants. A senior government official told The Associated Press that police suspect that Kurdish militants carried out the attack, which occurred on Ankara's main boulevard, close to ministries. At least one of the bombers was a woman, he said. The official spoke on condition of anonymity on the grounds that the investigation was ongoing. The bombing was the third in the city in five months and came as Turkey is grappling with a host of issues, including renewed fighting with Kurdish rebels, threats from the Islamic State group and a Syrian refugee crisis. Earlier Sunday, Turkish authorities said they were imposing curfews on two mainly Kurdish towns where Turkey's security forces were set to launch large-scale operations against Kurdish militants. Russia on Sunday also accused Turkey of sending its military across the Syrian border to prevent Kurdish groups there from consolidating their positions. The attack came just three weeks after a suicide car bombing in the capital targeted buses carrying military personnel, killing 29 people. A Kurdish militant group which is an offshoot of an outlawed rebel group, the Kurdistan Workers' Party, or PKK, claimed responsibility for the Feb. 17 attack. President Recep Tayyip Erdogan issued a statement vowing to bring "terrorism to its knees" and said Turkey would use its right to self-defense to prevent future attacks. "Our people should not worry, the struggle against terrorism will for certain end in success and terrorism will be brought to its knees," Erdogan said. Saudi state television said that a Saudi woman and three children were among those wounded in the attack. Saudi Arabia's King Salman condemned the bombing and extended his condolences to the Turkish people, according to the state-run Saudi news channel Al-Ekhbaria. At least 19 of the wounded were in serious condition, Health Minister Mehmet Muezzinoglu told reporters. He said that 30 of the victims died at the scene, while the other four died at hospitals. Interior Minister Efkan Ala said the attack wouldn't deter the country from its fight against terrorism. He confirmed the blast was the result of a car bomb that targeted civilians at bus stops on Ataturk Bulvari close to Kizilay square. Ala said authorities had obtained evidence pointing to the group behind the attack, but said an announcement would be made after the investigation is completed, most probably on Monday. No group has claimed responsibility. The private NTV news channel said several vehicles caught fire following the blast which also shattered the windows of shops that line the boulevard and the square. Dogan Asik, 28, was on a packed bus when the explosion occurred. "There were about 40 people," said Asik, who suffered injuries to his face and arm. "It (the bus) slowed down. A car went by us, and 'boom' it exploded." Police sealed off the area and pushed onlookers and journalists back, warning that there could be a second bomb. Forensic teams were examining the scene. The U.S. Embassy had two days earlier issued a security warning about a potential plot to attack Turkish government buildings and housing in one Ankara neighborhood and asked American citizens to avoid those areas. The cab bomb went off in a different neighborhood. As with the previous bombings, Turkish authorities quickly imposed a ban Sunday preventing media organizations from broadcasting or publishing graphic images of the blast or from the scene. The state-run Anadolu Agency said the government-run telecommunications agency had decided to block access to websites that published images from the scene. The country's pro-Kurdish party, the Peoples' Democratic Party, meanwhile, condemned the attack and said it shared the pain. The statement was significant because the party has frequently been accused of being the political arm of the PKK — an accusation it denies — and of not speaking out against PKK violence. The attack drew international condemnation in statements issued by Israeli Prime Minister Benjamin Netanyahu, Russian President Vladimir Putin, U.N. Secretary-General Ban Ki-moon and NATO Secretary-General Jens Stoltenberg, among others. U.S. State Department spokesman John Kirby reaffirmed Washington's " strong partnership with our NATO ally Turkey in combatting the shared threat of terrorism." Hundreds of people have been killed in Turkey in renewed fighting following the collapse of the peace process between the government and the PKK in July. The country has also been struck by several bombings in the last year that were blamed on the Islamic State group after the government joined U.S.-led efforts to fight the extremist group in Syria. The deadliest came in October when a bombing at a peace rally outside Ankara's main train station killed 102 people. Authorities have imposed curfews in several flashpoints since August to root out militants linked to the PKK, who have set up barricades, dug trenches and planted explosives. The military operations have raised concerns over human rights violations and scores of civilian deaths. Tens of thousands of people have also been displaced by the fighting. On Sunday, Russian Foreign Minister Sergey Lavrov said Russia has evidence of Turkey's "creeping expansion" in northern Syria. "According to our information, they are digging in a few hundred meters from the border inside Syria," Lavrov said in an interview with Russian REN TV broadcast on Sunday.